Time: 12:30 – 2:00 p.m.
Light lunch served at noon outside Scarfe room 310. The Lecture commences at 12:30 pm. There is no need to RSVP. Yes, yes, the past gets in the way; it trips us up, bogs us down; it complicates, makes difficult. But to ignore this is folly, because, above all, what history teaches us is to avoid illusion and make-believe, to lay aside dreams, moonshine, cure-alls, wonder-workings, pie-in-the-sky—to be realistic. 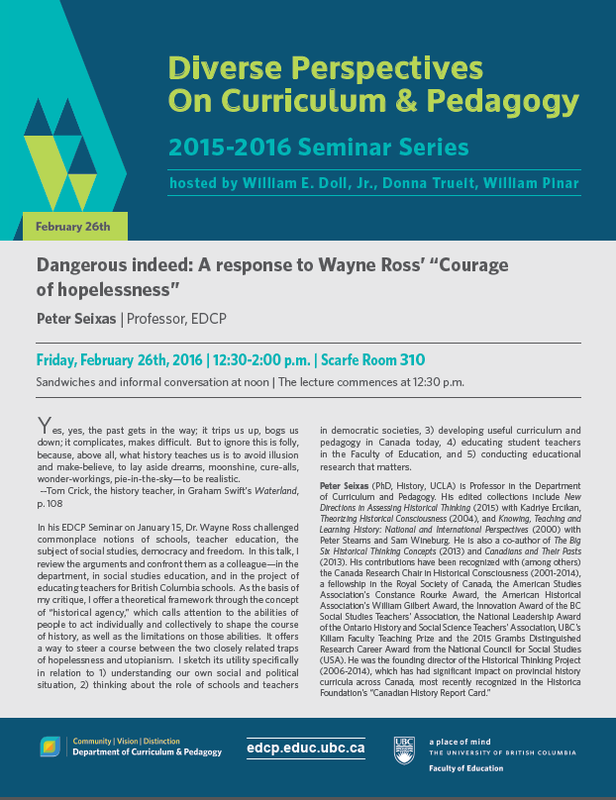 In his EDCP Seminar on January 15, Dr. Wayne Ross challenged commonplace notions of schools, teacher education, the subject of social studies, democracy and freedom. In this talk (text, video, powerpoint), I review the arguments and confront them as a colleague—in the department, in social studies education, and in the project of educating teachers for British Columbia schools. As the basis of my critique, I offer a theoretical framework through the concept of “historical agency,” which calls attention to the abilities of people to act individually and collectively to shape the course of history, as well as the limitations on those abilities. It offers a way to steer a course between the two closely related traps of hopelessness and utopianism. I sketch its utility specifically in relation to 1) understanding our own social and political situation, 2) thinking about the role of schools and teachers in democratic societies, 3) developing useful curriculum and pedagogy in Canada today, 4) educating student teachers in the Faculty of Education, and 5) conducting educational research that matters.